Sophia loves to draw, color, paint, cut and glue. If there was full-time employment available for a four year old artist, she would get the job. She colors at the dinner table, cuts paper in the living room and draws in the car. 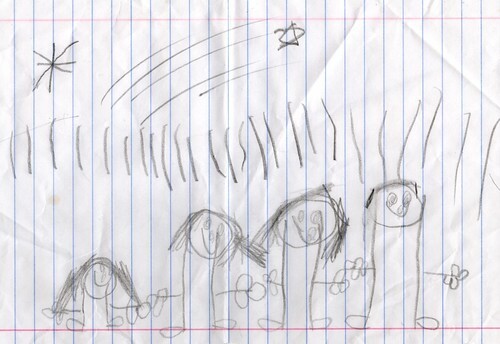 Here is one of her latest works from a recent drive to daycare – a Sullivan family portrait. I told her I would publish it to our website. Sophia did ask me to mention that she was bothered by all of the bumps (potholes) that we encountered on our drive. It makes it very difficult for her to complete her drawings when she gets knocked around so much. Because of the harsh winter weather, the streets in our neighborhood and throughout the city have taken a beating. Sorry Sophia, the city crews are working on it.